A weekend of wet weather didn’t dampen the Tigers’ spirits, with several sides poised to take out first innings points next weekend. First grade are one such side that sit in a fairly dominant position after day one. After losing the toss and being sent into bowl, the Tigers quickly made the most of the difficult conditions they had at their disposal, claiming two scalps with less than 20 on the board through the bowling of James Bazley (2/52). A small partnership briefly kicked the South Brisbane innings into gear before Bailey Stewart stepped up to the crease to take two top order scalps in quick succession. Another strong late order partnership once again got South Brisbane back into the game, but some more tight bowling from Bailey Stewart – who finished with 4 wickets - restricted the home side to 220. The Tigers will resume at 0/13 next Saturday. Second grade finished a difficult day of batting with 7/207 on the board thanks to another patient innings at the top of the order from Michael McEwan (31). The top order fought hard throughout the morning session in combination with McEwan, but found themselves in a spot of bother when they entered the tea break at 7/98. Craig Weier (46*) and Jamie Ryan (52*) played smart cricket during the afternoon session to save the Tigers’ blushes and give themselves and the other Redlands quicks something to bowl at next weekend. Third grade are also in a good position heading into next weekend after they won the toss and elected to bowl first on Fred Kratzman Oval. Klinton Goodridge’s 15 over spell yielded three wickets to help Redlands restrict South Brisbane to 7/121 when stumps were called 50 overs in to play due to bad light. Fourth grade have set themselves up for first innings points next weekend thanks to some incredibly disciplined bowling in conditions tailor made for swing and seam bowling. 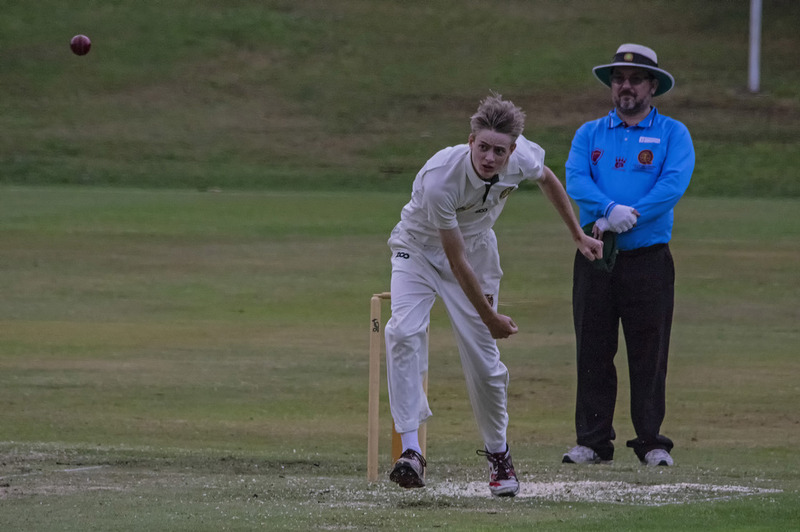 After waiting around for more than two hours thanks to a heavy downpour six overs into the day’s play, Pearce Anderson took two quick wickets to put the opposition on the back foot. An excellent final spell from Lincoln Rosiak (2 wickets) just prior to stumps helped reduce South Brisbane to 6/74 at the close of play. Fifth grade had a day out on Sunday afternoon and will return next weekend ready to defend their first innings total of 272. After losing two early wickets, skipper Michael Moss and Dylan Grey came together to steady the ship. Grey was dismissed with 31 to his name, but Moss marched on, scoring a quick fire century to ensure his side would post a competitive total. The Tigers had seven overs at the South Brisbane openers prior to stumps but were unable to take a wicket. Sixth grade one won the toss and elected to bowl against South Brisbane away from home, but thanks to persistent rain, were unable to bowl more than 6 overs. Sixth grade two were also at the mercy of Saturday’s inclement weather, but managed to finish the day 4 down for 118. Pat Cummins (24) and Matthew Williamson (24) did a good job in nullifying the Wynnum-Manly new ball bowlers in difficult conditions, and made the job significantly easier for the middle order. Khaleel Waqar profited from the openers’ hard work with 46 not out and will resume next weekend alongside Jake Davies as they look to progress the score beyond 200. The Redlands Tigers Lord’s Taverners side won their fourth game on the trot against the previously unbeaten Western Suburbs to secure their spot on top of the table. In conditions mirroring those seen across the weekend in a number of grades, Redlands opener Luke Davies (51) in combination with Sam Geyer (57) saw the Tigers through to a challenging, but by no means insurmountable, total of 197. Josh Smith (2/22) set the tone as the Tigers began their bowling innings, taking a wicket with his very first ball and adding a spring to his teammates’ step in the process. A partnership of 58 for the second wicket got the home side back into the game, but an incredibly economical spell from Luke Davies, backed up by Dale D’Souza (2/28), put the Tigers back in control. The leg-spin of Carter Pearson (2/23) played a hugely influential role as the game reached its climax, but it was Luke Davies’ second spell – which saw him finish with figures of 2/7 from 7.2 overs – that killed off any hope of a miracle run chase. Special mention must also go to Reuben Burger, whose six dismissals – including an unbelievable full stretch catch to end the game – played a pivotal role in the Tigers’ victory. The Redlands’ ladies side were also in fine form as they graced the hallowed turf of Peter Burge Oval for the first time this season. The Tigers made Gold Coast pay for their decision to bowl first, piling on 206 runs from their 40 overs. Keeley Richards was the chief destroyer, scoring 76 in quick time after the Tigers had earlier slumped to 2/14 through consecutive run outs. Heidi Thompson (20) assisted Keeley in recovering the Tigers innings as they combined to post 50 for the third wicket. Hannah McLaughlin (18) and Jess Sanders (14*) came together thereafter to push the score beyond 200. The Gold Coast had no answer to the bowling of Clodagh Ryall, who claimed five wickets - including three of the top five – to help dismiss the visitors for 135 in the 32nd over.